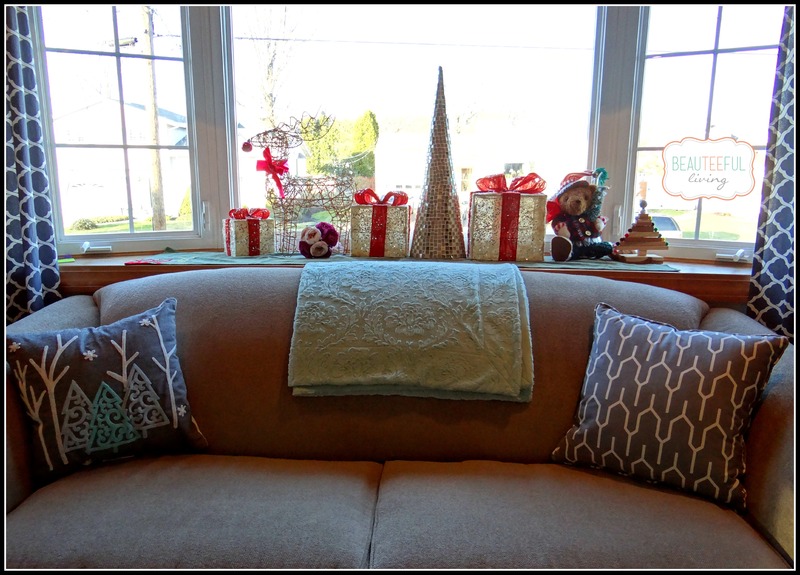 When it comes to holiday displays around our home, there are 3 main areas I focus my attention: Living room’s buffet table, Family room’s fireplace, and Living room’s bay window. 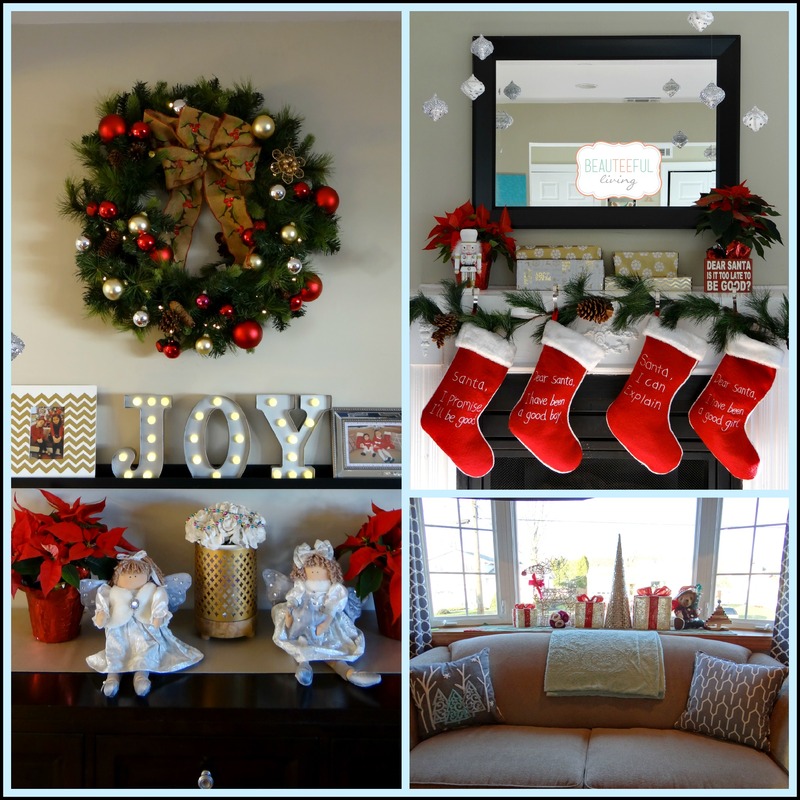 In today’s post, I’d like to take you on a Holiday Decor Tour around our home. Note: Up until last year, I used to steer clear of poinsettias. Well, last year, Chris brought home poinsettias and I began to change my tune. 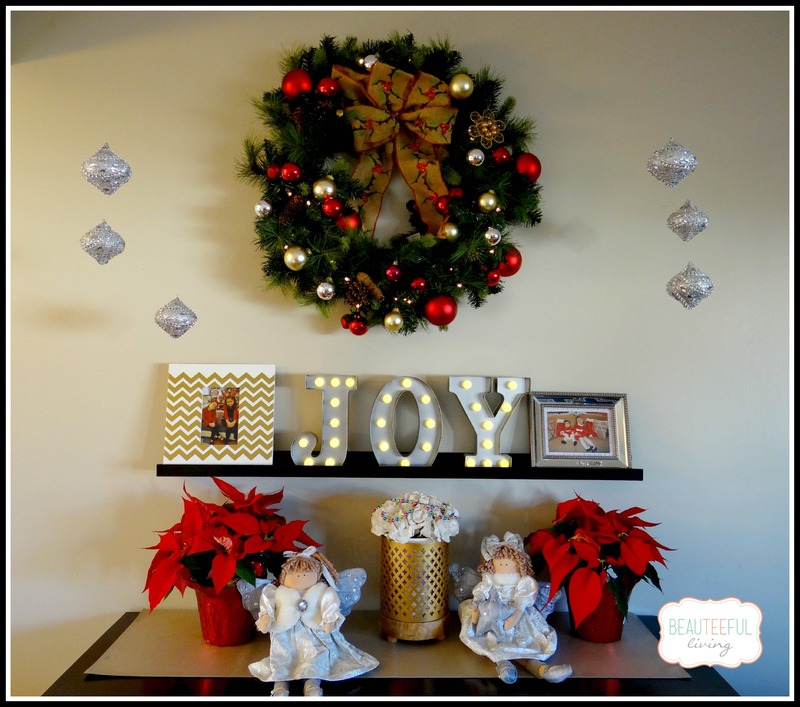 After seeing the poinsettias on our fireplace, I realized the reasons why I hated them (so red, so traditional, so obvious…) were exactly what adds to the look of the holidays in our home. I have to give Chris credit for purchasing the red stockings hung on our fireplace. Would I have chosen them at the store? Probably not. My choices would probably veer toward the glittery, shiny, and more modern designs. However, I must say I love each of the sayings embroidered on the stockings. Nothing like a touch of humor for the holidays! One of the benefits of having a bay window is being able to place junk decor items on the sill. I’m sure my dogs hate it when I have this area decorated for the holidays. It just means less room for them to lounge around. They love barking at our mailman from this spot! In this photo, you’ll see 2 new pillows I bought for this holiday season. I can’t seem to stop buying pillows! I love how simple yet still festive our “tree” pillow looks against our sofa. Is there a particular decorative detail you like most from this tour? Like this post or have a comment? I’d love to hear your thoughts! Stick around the blog for more year-end topics ahead! I’d like to thank Michele @ Shelstring for including me on this wonderful Holiday Blog Hop! Very fun decorations. I really like the “joy” sign and the sayings on the stockings. I just love your stockings and the decor on the sofa table. Great post! Your tour is beautiful! But stockings make me smile! Thanks so much for hosting the tour, Michele! I like them all. You did a terrific decorating job. The bay window bit about your dogs made me laugh. I love this tour! That tree pillow is adorable and I love how you hung those ornaments! They look beautiful! Looks fabulous! I love all your decorations especially the bay window decorations and the mantle. Really you have a great decorating skills. I love the decorations you did a really great job. I love it. those are some great designs. we use our fireplace mantle as well. Everything looks beautiful! Now I feel bad, all we do is put up a tree and a wreath on the door! I love seeing everyone’s decorating styles! I love your holiday mantle! So pretty! What a lovely home you have created! Thanks so much for sharing. 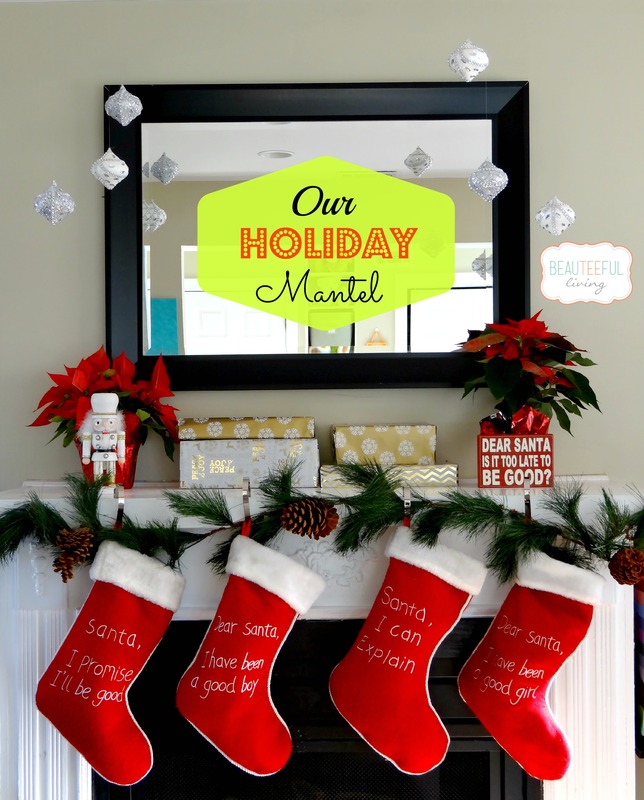 I love the mantel! I wish I still had a fireplace. Great job! You’ve done a lovely job with some standout colors! Our house is nowhere near this clean! Nice decor! Great idea! I love the bay window area especially! Oh thank you for this inspiration! It looks beautiful that’s what I would love for mine to look like! Thanks for the kind words, Claire! I love all the decorations, it looks so beautiful! Everything looks like Christmas is near! I think you did a great job! I love that wreath!! You put everything together so nicely! With my little ones thats difficult – my youngest pulls down everything! LOL But great job! These are beautiful pictures, Theresa. I love your stockings. So cute! Pinned on Pinterest. Your house is so lovely – I am loving those stockings! I love the window area, the ornaments suspended from the ceiling, and the JOY you used! Everything looks festive and ready to celebrate! 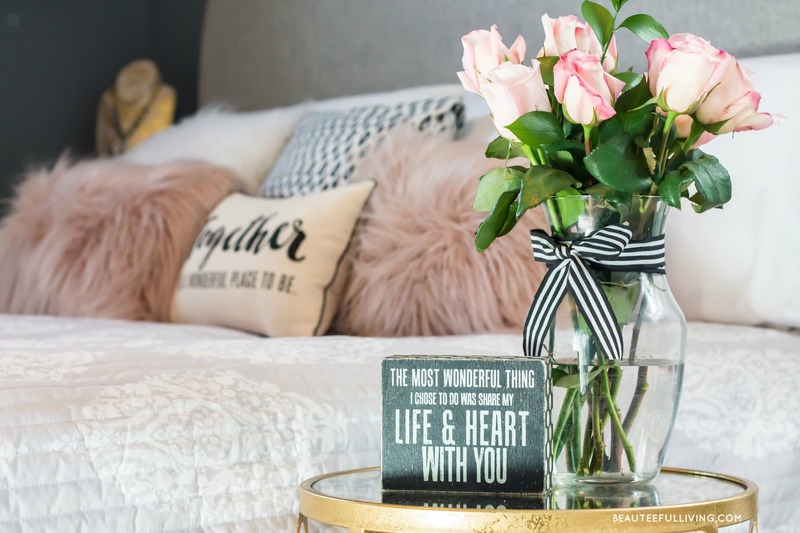 Wow, I love your decor! I wish mine was done that nicely! Great decorations! I wish I had this type of skill at decorating! Love your Christmas decorations. Everything looks so pretty. Your mantel is absolutely beautiful. I am loving these decorations. I love the living room decorations. I love your decorations especially those on the mantle. It all looks lovely. I barely had time to get up a tree this year LOL.